This formula is very similar to the Watermelon-Mango formula nutritionally speaking but with a higher fat content and a different flavor profile. This formula is a favorite among our crested geckos in and is devoured readily by all of our geckos. Can be alternated with the PFM Watermelon Mango or fed exclusively. 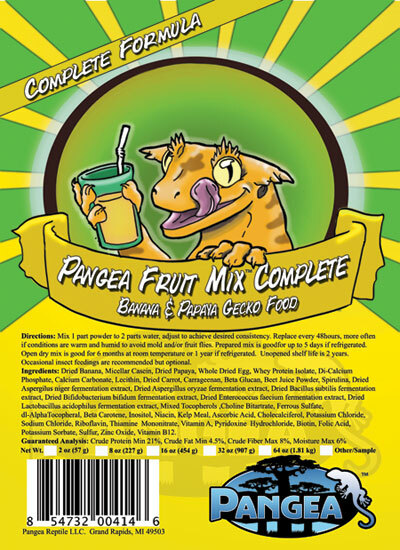 PFM Complete Diet uses a combination of fruits that your geckos won't be able to resist. It has been formulated using only the highest quality ingredients, including All Natural Dried Fruits, Whey Protein Isolate, Egg White, Bee Pollen, Spirulina, Probiotics, and more. Our ingredients are selected to contain very low levels of Anti-Nutrients like Oxalates and Phytates. We do not use any seeds, nuts, seed meal, cereal grains or high oxalate fruits or vegetables in our product. We developed this product here at Pangea and hired a PhD in animal nutrition to make sure we got it right.